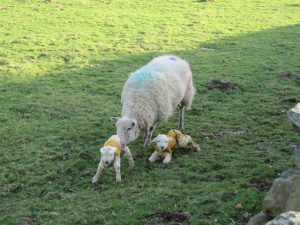 As I write, lambing is getting underway in the valley. There have been several lambs around for a few weeks in Lorton and over towards Workington and now new arrivals are gradually creeping closer to home. When I went down to Crummock recently there was a little gang down towards the pump house who were practising their vertical take-offs – they look so funny, you can’t help laughing at them. There were some beautiful days in March and spells when it was so dry I had to water the tubs in the courtyard! The containers are all looking very good with lots of spring bulbs adding a splash of colour. I had a week earmarked to have Crummock Cottage’s sitting area repaved and fortunately we were able get it done without any delays from the weather: trying to create a ‘random’ pattern of slabs in a sheepfold shaped area was a bit mind bending but it is looking very smart and will make a lovely area for relaxing outside. At the beginning of the month it was the annual Words by the Water Festival in Keswick. I always enjoy going to events there and Margaret (my sister) joined me for the week. We went to a wide range of events, all very enjoyable, including Martin Wainwright, the Northern editor of the Guardian talking about ’True North,’ Keith Richardson launching his book , ’Jak’s Yak’, on Cumbrian trees and Val Corbett sharing some beautiful photos from her book ‘Winter Landscapes’ and her forthcoming book on rain – should be interesting ! The audiences at these events are very participatory, adding comments and information or even correcting speakers! It was also a very sad week as we heard of the tragic death of Mark Weir, the owner of Honister Slate Mines. He will be a great loss: every community needs people like him and we will miss his small green Gazelle in the skies above us. One of the real pleasures of the Lake District out of season is that you can go to places that tend to get very busy and hardly see a soul. Clare, my daughter, was with me for a week recently and we went to Beatrix Potter’s house, Hilltop, very small, very lived in, quite ‘girly’ in an old fashioned way – altogether delightful! 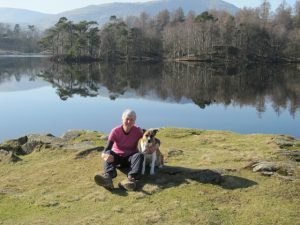 We then went for a walk round Tarn Howes and picnicked in the sunshine with a backdrop of that iconic view: there was scarcely anyone else around! Finally, thank you to everyone who has who contacted me to say how much they like the new website!